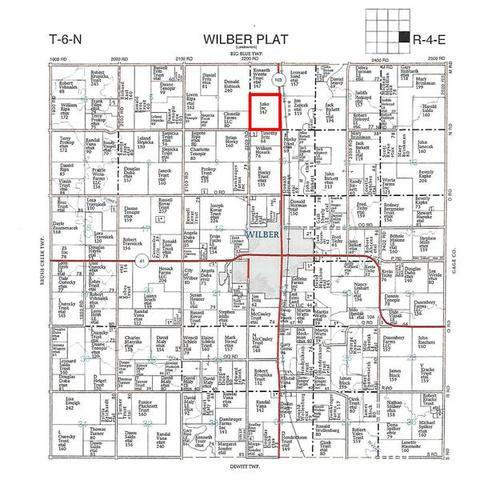 FARM LOCATION: 2230 County Road N (From Wilber, North on Hwy. 103 1 Mile to County Road N, then West ¼ Mile to Home). This Top Producing Saline County Farm features nearly 113 Acres of Tillable Land, both Irrigated and Dryland, with an additional 37 acres currently in Native Grass Pasture. There is an irrigation well that services the East side of the Farm and has been irrigated by using flood irrigation. The soils in this Top Producing Farm are very good, with 66% that are Class I & II Muir & Crete soils, with the balance in Class III Longford soils and Class IV Deroin & Geary soils. The farm also features Hwy. 103 frontage on the entire East Boundary and also features great access on the entire South Boundary with County Road N frontage. There are also 2 small ponds on the property and some trees for some recreational uses, along with the 37 acres in Native Grass Pasture, currently being cut for hay. A very nice, Top Producing Farm to add to your current operation, with the Irrigation Well already drilled, a center pivot irrigation system could be utilized with some tree removal and a little dirt work. Full 2019 Crop Year Possession given to Buyers on March 1, 2019! 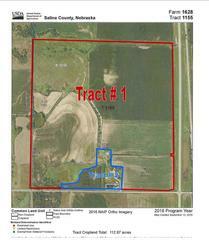 This tract features a nice older 1 ¼ story Farm Home with several outbuildings on approximately 10 acres of land. The home features 2 Bedrooms, Large Open Country Kitchen with an eating area, separate Dining Room, Living Room, Full Bath Area, Main Floor Laundry, Enclosed Front Porch, 150 Amp Main Breaker Panel, 40-Gallon LP Gas Water Heater, LP Gas Carrier Furnace with Central Air Conditioning, Newer Roof & Steel Siding (2015), Partial Basement & More. Outbuildings consist of a 40’ x 52’ Open Machine Shed, an older Barn with Lean-to, a 24’ Diameter Steel Grain Bin, and several older storage sheds in various stages of repair. There will be approximately 4 acres of cropland in this tract along with the balance being in building site and some trees. This property is located just ¼ mile from Hwy. 103, 1 ½ miles from Wilber and less than 4 miles from major employers just North of the Property, along with being only 8 miles from Crete. If you are looking for a great starter acreage close to the highway and major employers, DO NOT MISS THIS AUCTION! Full Possession on March 1, 2019. 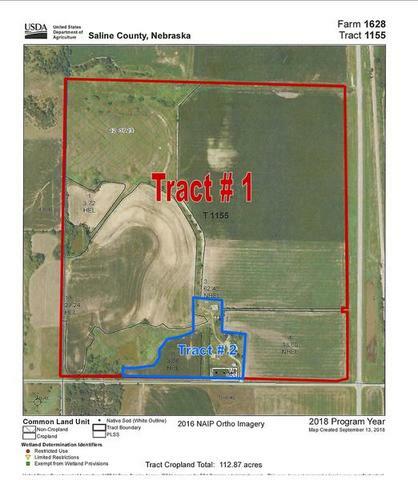 LEGAL DESCRIPTION: The Southwest Quarter (SW ¼) of Section Three (3), Township Six (6) North, Range Four (4) East of the 6th P.M., except approximately eight (8) acres conveyed to the state of Nebraska, which deed is recorded in Book 107 at page 5 in the office of the Register of Deeds of Saline County, Nebraska, and subject to all easements, restrictions, reservations and rights-of-way of record, and subject to all encumbrances of record, containing 152 acres, more or less. SURVEY: The Farm is being offered in 2 separate tracts. If they are purchased by 2 separate buyers, a boundary survey will be completed on both tracts with the cost being divided equally between both Buyers and Seller (Each party pays 1/3 of the total cost of the Survey). If both tracts are purchased by the same person, no boundary survey will be completed. If new buyer of both tracts desires a survey, it will be at their entire cost. POSSESSION: Full 2019 Crop Year Possession will be given to the New Buyers of Tract # 1 on March 1, 2019 (Tenants have rights until February 28, 2019). Full Possession of Tract # 2 (Acreage Site) will be given to the New Buyers on March 1, 2019 (Tenants will be subjected to pay rent at new Buyers discretion from date of Closing until February 28, 2019). If tenants surrender their rights at any time sooner than February 28, 2019, new Buyers will have Full Possession sooner. TERMS OF THE AUCTION: A $ 50,000.00 Earnest Deposit on Tract # 1 and a $ 10,000.00 Earnest Deposit on Tract # 2 will be required on Auction Day. The balance on both tracts will be due on or before December 5, 2018. Title Insurance & Escrow Close Fees divided equally between Buyers and Seller. Marketable Title. 1031 Tax Exchanges Welcome. Agents Represent Sellers. SHOWINGS: Guided Tours of the Home will be available ONLY by contacting the Auction Company. Please allow 48-72 hours prior notice for a Showing. AUCTIONEER’S NOTE: Make your Plans now to Attend this Interesting Absolute Auction. The Farm is being sold to dissolve a Family Corporation and is being sold Absolute to the Highest Bidder – No Minimum Bids or Reserves! If you are in the Market for a Top Producing Farm or a Great Starter Acreage to buy at your Price, DO NOT MISS THIS AUCTION! For Further Information, Brochure, Photos or Private Tour of the Home, Please Contact the Auction Company or visit the website at www.nitzauctions.com. FARM LOCATION: From Wilber, 1 mile North on Hwy. 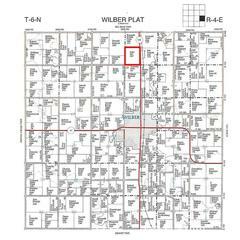 103 to County Road N (Farm is in the Northwest corner of the Intersection of Hwy. 103 & County Road N).